Bottom Ported Speakers in a Flat? Potentially looking to purchase a new set of floorstanders which are ported on the bottom. I live in an old Victorian flat conversion, with no real floor work, so merely the floorboards, and thin underlay/carpet. I've never heard, or owned bottom ported speakers before, and I am unable to get a demo of these speakers to try before hand (I know I know!). Just wanted to get some thoughts/experiences of bottom ported speakers and even better if any users had them in a similar flat? I currently own two different bottom ported speakers. Neat Momentum 4i's & Impulse Lali's. In a flat in a room around 11' x 14' and although they do excite the room, nothing to worry about overly and definitely curable. However the floor is concrete and that surely makes a difference. I owned the Momentum 4i's in a different home and the floor was suspended late Victorian floors and there were big boom issues. Everything is fixable, depends on time, effort & money! My main thought is that I would not buy new speakers I have never heard. Yes I was thinking this as an option if its too much boom, mounting the speaker on something such as a granite chopping board and some acoustic foam underneath . I did this before with a set of Q Acoustic Concept 40's though, and the speakers lost all their dynamics. So you found it was too much in a flat? Yeah, I wouldnt ever spend 10k on a set of speakers, even if I could afford it I'd rather spend £2-3k on a set and give £7-8k to a local food bank. Yeah thanks man, I have a good couple of those Ive used for isolation platforms before. Isolation platforms arent an issue, its more getting experience thoughts on how bad it would be or effective with isolation. Sounds like it could be an issue though, which is making me wary of the speakers now. So you found it was too much in a flat? Not too much just there were compromises. The louder you played, the more it excited the room. I haven't put too much effort in to fixing this as it was always going to be a temporary property, just to make money on and move forward, something we are currently in the process of doing. Then the journey starts again seeing and hearing where the compromises are. This time I will sort them as it's a longer term property... Of course only if there are issues! What where the compromises? Im not particularly into loud music, I only opt for floorstanders as for me they just give a lot more 'presence' over stand mounts. Thats mate, appreciate the thoughts. What where the compromises? Im not particularly into loud music, I only opt for floorstanders as for me they just give a lot more 'presence' over stand mounts. 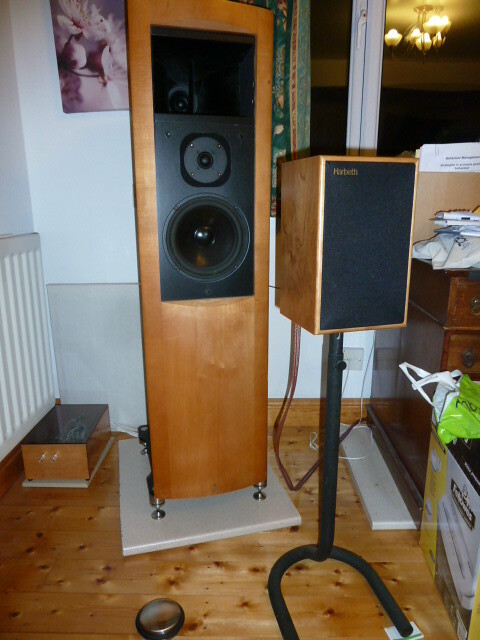 Horses for courses, I recently heard a pair of Standmounts that gave far more 'presence' than some Floorstanders I have heard! Compromises, if you were near you could pop over to hear, mostly at low volume not much at all... Louder they go, then Bass boom exists. Mainly a significant change resulting in a much better presentation was to shift speakers firing down the room, rather than across from the widest wall. Depends on whether this would fit with domestic harmony? Are you thinking that because they are ported at the bottom they will interact more with the floor? If so, I think that’s largely a myth, because at bass frequencies the speakers typically radiate omnidirectionally. So you’d get the same output, wherever the port sat. A port doesn’t squirt extra doses of bass through its opening; it’s simply one way of loading the bass driver to control its resonance. Having had standmounts since the early nineties, I've no idea. However, it looks like I'm going to find out in a couple of weeks. It was either existing speakers and adding a sub or go for bigger speakers. I couldn't quite get over old prejudices to go for the sub, but I did torture myself over it for quite some time. I'm concerned it may be a bad case of bass overload whichever way I went, but it'll be fun finding out.